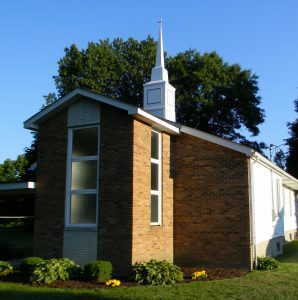 God gave the vision for a Baptist Church in the Village of Cattaraugus first in the heart of Pastor Art Kohl and the people of Faith Bible Baptist Church in Eden, NY. After much prayer and time, God provided for FBBC to purchase the building on Gail Drive (formerly an Apostolic church). While waiting for the building purchase to complete, in Fall 2014 Pastor Kohl contacted his friend Thaddeus Kuntz (who was then traveling full-time as an evangelist and helps ministry) and presented his own burden for the Village of Cattaraugus and surrounding area. Pastor Kohl asked Kuntz to pray about pastoring this new work and, over the next several months, God began confirming that direction. In March of 2015 God made His call clear in the heart of Kuntz while reading through Numbers 32 on Monday morning March 2. In May Kuntz purchased a “handy-man special” house in the Village of Cattaraugus, and his family was able to move in to it just as the sale of the church building was finalized in August. To the glory of God, Bright Way Baptist Church held its first service on October 4, 2015. We welcome you to join us for a service. You can expect to enjoy a variety of music including many classic hymns and preaching from the King James Bible. On July 1st 2018 Pastor Kuntz preached his last message at our church. We are currently holding meetings each Sunday – Sunday School starts at 10 AM and a Morning Service at 11 AM, We are currently looking for a new pastor. Bro Tony Bucco teaches our Sunday School class, and we have special speakers filling the pulpit until we get a new pastor. We are excited to keep our doors open and look forward to a great future. Come join us!